In an alternate New Orleans caught in the tangle of the American Civil War, the wall-scaling girl named Creeper yearns to escape the streets for the air--in particular, by earning a spot on-board the airship Midnight Robber. 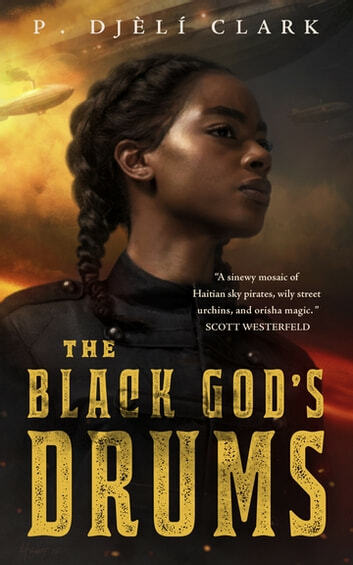 Creeper plans to earn Captain Ann-Marie’s trust with information she discovers about a Haitian scientist and a mysterious weapon he calls The Black God’s Drums. I just finished The Black God's Drums and I wanted to write an immediate review to capture the feelings have for it while they're fresh. I was truly sad for it to be over, but I mean that in a good way. It is such a well-written novella that's paced evenly with a great narrator in Creeper. Her youth, exuberance, and general innocence shines through and gives the story good flavor. The author captures an alt-history New Orleans in ways that we readily recognize it, but the mix of French Creole and English, and the cast and characters that live in the city, helps to give this New Orleans strong character. Throw in a pirate captain (Anne-Marie), a pirate airship (The Midnight Robber, a great pirate ship name, by the way), and two well-informed nuns who know everything about everyone, and I couldn't help but enjoy this. I wanted more of Creeper, more of Captain Anne-Marie, and more of this New Orleans. It's a great mesh of alt-history that depicts the results of the African diaspora spun through excellently conceived fantasy.